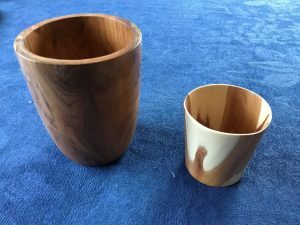 Tom Crowther will have more of his amazing wood turned articles on sale at The Friends lunch at Fishmore Hall on Thursday, October 11. They’re ideal for Christmas presents. The popular lantern walk over Whitcliffe will take place this year on November 3 at 4.30 pm. Tickets in advance from Bryony at Shropshire Wildlife Trust. There is a difference this year. There will be no lantern making workshop. Lanterns will be supplied within the £5 ticket price. Sorry if you were slightly delayed yesterday Sept 27.We had to deal with a big ash trees above the hairpin bend using a hydraulic lift. The work took two hours for the tree surgeons and another three hours for volunteers to clear up and reopen paths. Unfortunately the work coincided with closure of Bell Lane and traffic was rerouted over Whitcliffe. We knew nothing about Bell Lane closure in advance. The pipes uncovered by work on the fish pass are believed to have once linked the tannery In Corve St with the pumping station at Mill St and appear on a map from the 1862 though what they carried, and what they may still contain is anybody’s guess. We will never know because the fish pass plans have been adapted to seal them in concrete. Work is once more progressing. The floor of the fish pass is now laid and the walls are now up. Work on constructing a new fish pass at Mill St weir is to commence in July. A compound will be established at Dinham Bridge and The BreadWalk will be used for access by contractors’ vehicles with a turning point constructed at the Mill St end of the walk out of stone. A decision will be taken on completion of the work whether to remove the turning point or leave it for future use. Information boards about The Teme and the weirs will be put at each end of the BreadWalk together with plans for the fish pass. The work is expected to take ten weeks and closures of the BreadWalk will be kept to a minimum. Work to resolve the broken oak and beech trees beside the road over Whitcliffe Common will be completed today. 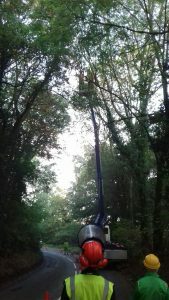 A giant 100 foot lift was brought in so that tree surgeons could remove the top of a beech tree which broke and wedged between the two trees. 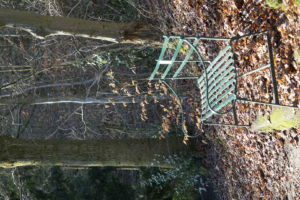 Since the original problem at Christmas time more boughs have broken from the beech which will be reduced to a stump. The oak tree will also be reduced but we hope will resprout. Tree damage has left Ludlow’s Friends of Whitcliffe Common with a £3000 bill for safety work. The volunteer group shares management of Whitcliffe with leaseholders Shropshire Wildlife Trust. The two have had to call in expert help to tackle the work needed on several dangerous trees. It will force the closure of the Breadwalk in one case and traffic control on the Wigmore road over the common in the other while safety work is carried out. Shrewsbury-based firm Ace Treecare, which has all the necessary equipment needed, will carry out the work. A number of FOWC’s volunteer work party will work under the supervision of Ace Treecare to help. Work will cover four days from April 30. The need for work on the roadside tree – which has been roped off for some days – is clear to see. Two massive branches have fallen and are wedged between the tree and a neighbouring one. On the Breadwalk there are fears a fallen tree on the steep slope will slide down onto the popular walk. The plan is to winch it down and cut it up. The winter, with its high winds and heavy rainfall, was to blame for the situation, said Mrs Jones. “The true cost of the care of Whitcliffe these days is around £20,000 a year so this extra cost is something FOWC and SWT could do without. But we exist to ensure the common remains beautiful – and safe. So the work has to be done. If you wish to become a Friend of Whitcliffe Common please contact Mrs Jones on daphjones3@outlook.co.uk or visit www.friendsofwhitcliffecommon.org.uk to download the membership form. A little known fact: Since January volunteers have put in 208 hours work on Whitcliffe Common, that’s the equivalent of 30 days labour in just over two months. 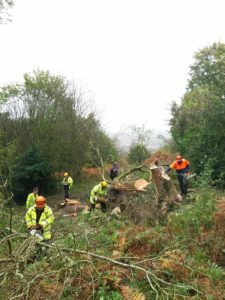 Among the list of jobs we accomplished before the nesting season starts were clearing a number of fallen trees, clearing rock faces of undergrowth as well as coppicing and maintaining paths. 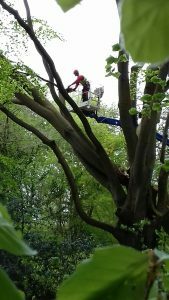 The start of the bird nesting season means generally we switch to other duties like path strimming to keep them clear however we intend to have a clean up of the waterfall area off the Breadwalk and there remain two dangerous trees to be dealt with by experts. One is on the Whitcliffe Road where the top limbs of a big beech fell into an oak tree, badly damaging it. The other is an ash tree uprooted and lodged above the Ludford end of the Breadwalk. 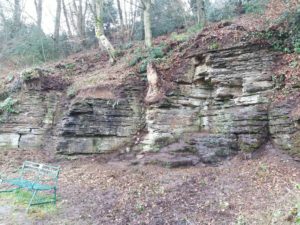 The world renowned rock faces along the Bread Walk at Ludlow’s Whitcliffe Common are set for a programme of clearance. 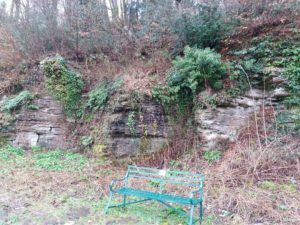 Concern has grown at the increase of invasive vegetation on the rock faces which are visited regularly by geologists from all over the world. So the Friends of Whitcliffe Common, in partnership with Shropshire Wildlife Trust, and with the backing of English Nature, have agreed a plan of careful clearance which will begin shortly. Advice on this work has been generously given by Ludlow’s eminent geologist and member of the Friends of Whitcliffe Common, Professor Michael Rosenbaum. English Nature has provided a grant to enable the clearance to be undertaken. The aim is to re-expose the geology for which this part of Whitcliffe has been famous for two centuries. This will allow the story to be told of how the rocks came to be deposited in a shallow sea south of the Equator, on the margins of an ancient ocean which was being destroyed. This had completely gone by the time the rocks on nearby Clee Hill were being deposited. There is evidence of earthquakes and volcanic eruptions, as well as the creatures which lived in those ancient shallow seas. In more recent times the story can be told of how glaciers once covered the town and caused the Teme gorge to form, a feature most thought had always been here, but we now know that the Teme used to flow miles further west. The clearance work will concentrate on half a dozen small areas, each of which will expose a critical part of the earth story. No large trees will be affected and clearance will primarily consist of removing ivy, brambles and dog rose as well as recently seeded saplings. The aim is to conserve the habitats for most living species while re-exposing the rock which provides an insight to the ancient world that forms the landscape which we now enjoy. The first stage of the programme, in the old quarry by Dinham Bridge, has already been completed. Next will come the area above the stone steps along the Bread Walk, and then four small areas in between. The work is being undertaken by volunteers within the Friends, supervised by the Wildlife Trust, and timed to avoid any disturbance to nesting birds and hibernating mammals and insects. Whitcliffe Common, situated on the southern edge of Ludlow in South Shropshire, is a wonderful recreation area for residents and visitors alike. It is maintained by the Friends of Whitcliffe Common in close conjunction with the leaseholders, Shropshire Wildlife Trust, so that future generations can enjoy this beautiful area. The Friends aim to provide an attractive, safe place to visit, walk and enjoy. This to include tree surgery keeping trees safe and allowing them to flourish, maintaining paths and steps, grassland management to improve wildflower growth, opening up and maintaining the views overlooking Ludlow giving not only a vision of the town, but also the landscape of the Shropshire Hills. Until last week when you sat on the bench in memorial to The Jacksons of Whitcliffe Cottages a scrubby holly tree blocked the once superb view to Clee Hill. Now you can see the view again from the bench thanks to work by the volunteers and Matt, the tree surgeon from Shropshire Wildlife Trust. Pictures below.